Highway 447 is the main road through Gerlach. If you visit the National Conservation Area, you’ll most likely find yourself on the 447 for at least part of your journey. This is our spring cleanup. We’ll provide trash pickers and bags, water, and high viz. shirts/vests. Bring your hat, sunscreen, and water bottle. 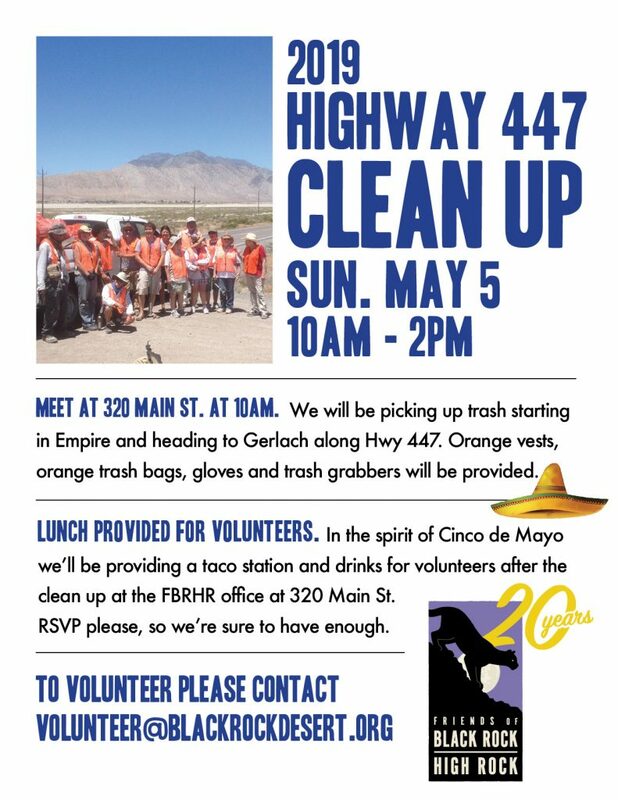 On May 5th, we’ll meet at the office at 9:00am before carpooling to the clean up areas, but you’re welcome to join anytime! We’d appreciate an RSVP from all our Road Restorers, or email us for more information. It’s also Cinco de Mayo weekend in Gerlach, with $45 rooms and $3 margaritas at Bruno’s Country Club. We’ll be hosting a taco bar for volunteers after the cleanup. Can’t make it? You can help by donating a small amount or becoming a member today. Your dollars will go to fuel, feeding our volunteers and general operations. We are year-round boots on the ground providing safety information, education and conducting stewardship projects. Help us as we partner with Burning Man, the Bureau of Land Management, other stewardship groups and the wonderful community of Gerlach NV.